First Slow-mo Booth available in Vancouver! Slow-mo booth available for weddings, events, parties, and so much more! 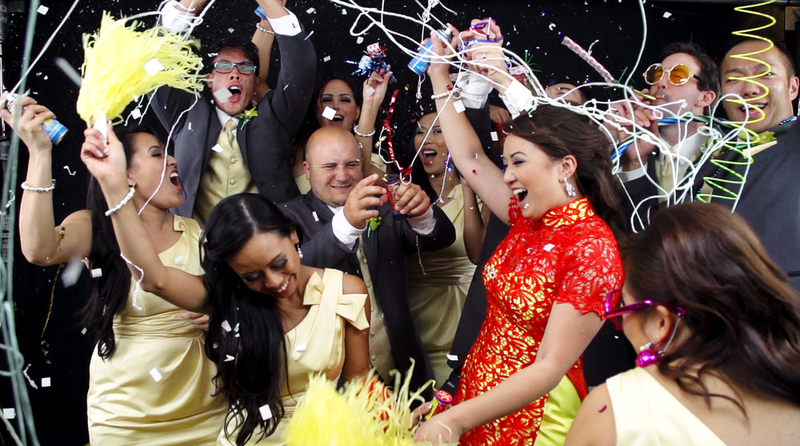 Frame-grab of the slow-mo booth at Linda + Wylen's crazy fun wedding! Thanks to SFST (Super Frog Saves Tokyo), a marketing firm in Seattle, WA, who made a video of slow-mo booth at their buddy's wedding and it went viral. Now everyone in the Vancouver wedding industry is talking about it. Many people are saying it's going to be the next big thing for weddings. We don't know if they're right but what we do know is, the guests at Linda + Wylen's wedding had a blast. Just check out the video below to see it for yourself! It totally went crazier than anyone had expected! So YES! it is happening for real! We aren't the first to come up with this amazing idea but we are very proud to be the first in Vancouver to bring and showcase a Wedding Slow Motion Booth video! Share your slow-mo ideas with us and we will make it happen! Slow Motion Booth available starting in September 2013! Ultimate Slow Motion booth starts at $1499 for the 1st hour of booth time. Popular 2-hour Basic Experience package is only $1999! You can now add instant prints to your booth for only additional $250/hour! Click here to see what the prints look like! Our team + guests and friends at Linda's Wylen's wedding. BTS Video! Contact us at info@modernromance.ca now! Go to the Contact page to fill up the form! From there, just a Contract and $500.00 booking fee (towards your package) and you will get the best slow-mo booth for yourself and the guests at your event!